We were in NC over the weekend again, and had a chance to leave the kids (with my parents, not just abandon them) and head into Asheville for a little sightseeing and dinner. If you’ve ever been there, you know I’m dead serious when I talk about sightseeing, or people watching. After some light shopping at our go-to places, we stopped for dinner at Seven Sows Bourbon and Larder. I wanted southern, since we’re in the south, and they delivered. It’s in a nice setting (though a bit noisy, being right on a main road, and with doors open), and the dining room is a nice blend of southern rustic. We started with some buttermilk hushpuppies (light, moist, and with a fantastic pimento cheese dipping sauce) and fried Brussels sprouts. 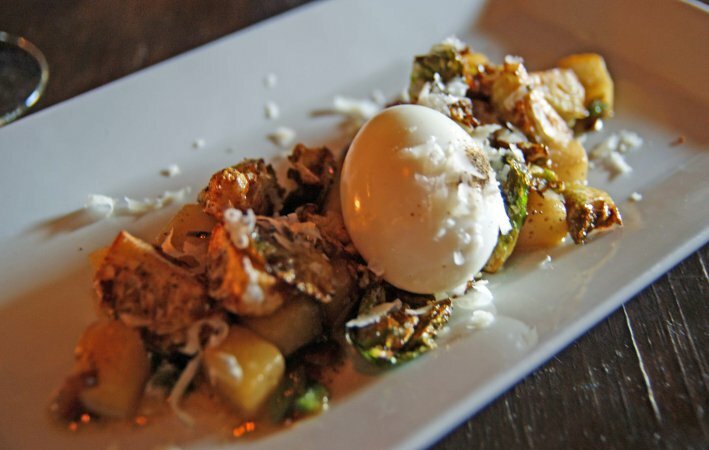 The sprouts were done up with a soft-boiled egg, bacon, and a root vegetable and jalapeno hash. They seemed to put jalapeno in just about everything, but it wasn’t overwhelming in anything. Nice combination of flavors, and a good start to the meal. 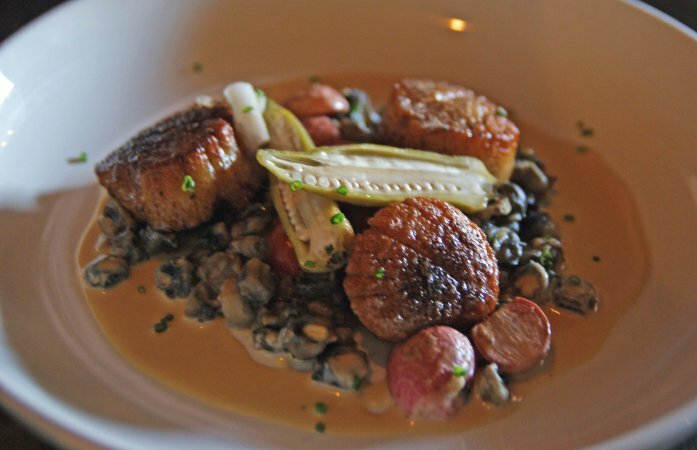 Main courses were scallops for S, over creamed blue corn hominy, radish, pickled okra and tomato, and shaved lardo. Lots of ingredients we don’t see much in Ohio, which all made for a very pleasant dish. 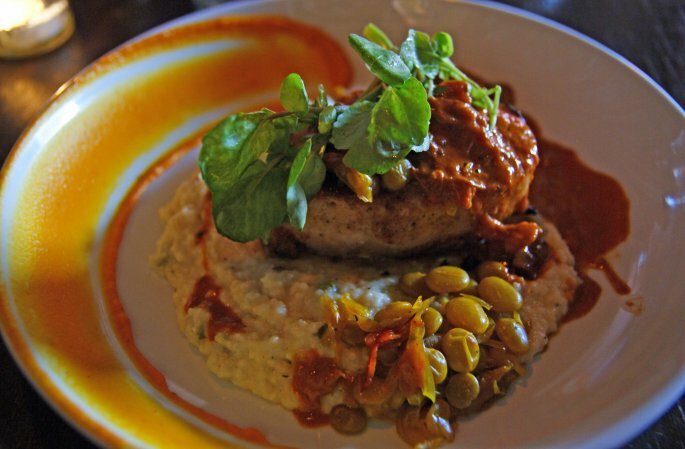 I had a pork chop with butterbean chow-chow, jalapeno-chevre grits, and smoked carrot butter. Again, stuff we’re not exposed to often, and to our dismay. The chop was perfectly done and the grits were very good, with just a hint of that goat cheese tang to balance the pepper. For dessert, we decided to walk up the street to French Broad Chocolates, a very well-known local chocolate spot. 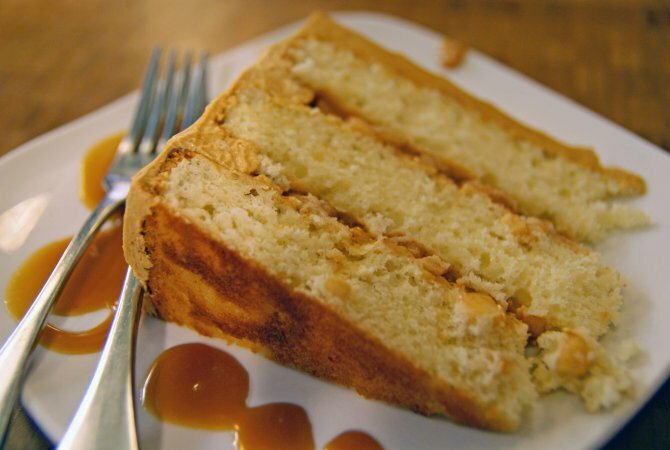 We had a slice of apple-caramel cake, with one of the best, lightest buttercream frostings I’ve had. 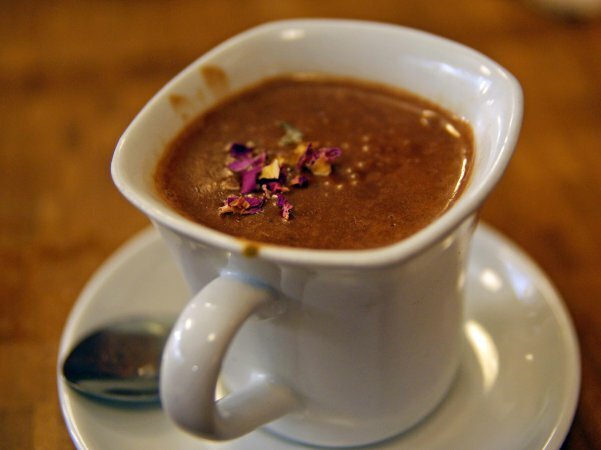 Along with that was a piping-hot cup of opulent sipping chocolate. Not hot chocolate like you’d make at home, but more along the lines of a melted chocolate bar (they actually call it a liquid truffle). Yum. If you’re ever in the area (even remotely), this is worth a stop.